(San Diego, California, USA): What do you know about Google Analytics? When I ask this question to potential customers every year, some people say they know what it is, some say they use it and some people say they've heard of it. That's a good start. 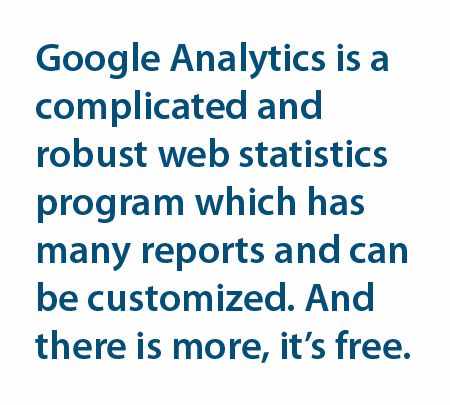 Google Analytics is Google's free web statistics service. It is one of the most realiable webs statistics programs that I know of and the best news is, is that is offered for free for any website and even to companies. Corporations or organizations with lots of web traffic, will pay for their service. Why is Google Analytics important? Before 2005, if you wanted excellent web statistics you had to pay dearly for it. As much as $6,000.00 USD per year (in 2005 U.S. dollars). Google Analytics s a very robust web stats service, provides excellent tracking, has hundreds of reports, can be customized for your business and it's free. 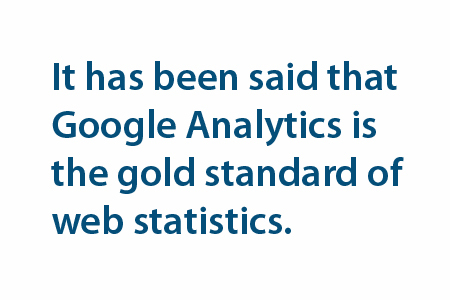 It has been said that Google Analytics is the gold standard of web statistics. That is why it's important. Here's an example of the accuracy of Google Analytics and the inaccuracy of your web hosts web statisticss. When I first uploaded Helicopter Links in December 2002, my hosting company provided me with web statistics. After several years of Helicopter Links being online, my hosting company was showing that I had about 100,000 visitors in a year. This was back in 2004 and 2005. I thought, wow, that is great! Here's some history of Google Analytics. In April 2005, Google purchased Urchin Software (Based in San Diego, California, USA - the makers of a very good web statistics analysis program) and Google then changed the name of that company to Google Analytics. Then in November 2005, Google announced they were giving this service away for free, to everyone. I remember when this happened and there were reports from web designers around the world, that they were thrilled and amazed that Google was providing this high quality service for free. According to some websites, Urchin charged around $500.00 USD per month (in 2005) for their web statistics services. That would be around $6,000 USD per year, to have accurate web statistics. That is a lot of money. No wonder why web designers were in shock when Google announced that Google Analytics was now free. One can be fairly certain that if you only use the web statistics program provided by your hosting company, your web stastistics will not be accurate and will not provide you with reports. To get a Google Analytics account, you either need a Google account or a Google Analytics account. It is best to do some research online on how to set up your account and/or take a class, watch some YouTube videos and/or get a book. It's very important to set up your Google Analytics account correctly from the start because Google Analytics can do so many things and you want to set it up so that you can have the reports you need for your business. Once you have your account, the Google Analytics main information page for your website is called the dashboard. Your Google Analytics dashboard is where you access your web statistics and create custom reports for your company. When you look up web statistics in Google Analytics, you can save information as a PDF, Excel, CSV or Google Sheets file. Therefore, Google Analytics is very useful because one can email a report to anyone who needs the information. Google Analytics is complicated. Back in 2010, I learned the importance of setting up Google Analytics correctly from the start. It's important to set three profiles for each website. 1) "Your Website" profile, 2) a "Testing Profile" and 3) a "Raw Data - Do Not Configure" profile. That way, there are three separate data profiles recording all the same web statistics from your website. Then to make matters more complicated, in 2012, Google upgraded Google Analytics to a new version officially known as Universal Analytics. If you have Google Analytics on your website, you want to upgrade to Universal Analytics code on your website and this upgrade is for free. If you don't use the new Universal Analytics code on your website, then you are missing out on accurate web statistics. Universal Analytics is more accurate and has more features than the original Google Analytics code. An important upgrade for Universal Analytics is that it can adjust the web statistics for someone who owns and uses multiple devices (such as someone owning an iPhone, a laptop and an iPad), and the reports will show this as one person (and not three people) visiting your website. What do we call it now? Google Analytics or Universal Analytics? Good question. If you visit the Google Analytics main web page or the Google Analytics Wikipedia page, they are still using the term "Google Analytics". In Google, I just typed the words, "Universal Analytics Wikipedia" and the first search result link was to the Google Analytics Wikipedia page. I think for most of us, we are still calling the new version Univeral Analytics, by the name of the older version, Google Analytics. Isn't this fun? If this article is confusing to you right now, just imagine how confusing it will be when you begin to use Google Analytics. More fun! I've read where Google Analytics professionals say that you can run an entire company using Google Analytics, including when to know to hire people. Who knows how true this is? If you have a website and are not using Google Analytics, I would recommend to use it. If you don't have a full-time web master, a business owner or administrative assistant can probably learn Google Analytics but there is a fairly steep learning curve. I would always recommend that the person handling Google Analytics to take classes, read books, read websites and watch YouTube videos on how to set up and how to use Google Analytics. If you have a full-time web professional, then it is really is the job of the owner to make sure their web professional is taking classes (either in a classroom or online), purchasing books, watching YouTube videos, etc. and has the resources to understand Google Analytics. The owner and other key managers who need these web statistics should be familiar with Google Analytics dashboard and be able to get reports by logging into Google Analytics. If a CEO or business owner relys soley on the web person to provide reports to all management people, that is being unfair to the web professional. Managers should be able to get into the Google Analytics dashboard so they can get the information themselves. This requires training. There's more. There are other free web statistics companies (and some are for-pay companies) and a Google search will reveal articles which compare Google Analytics to other web statistics companies. Yes, really. Last but not least. It is good to know that all web statistics have error rates. No matter what company you use for your web statistics, they are not 100% accurate. A key point to remember is that web statistics are not about absolutes but trends over time.